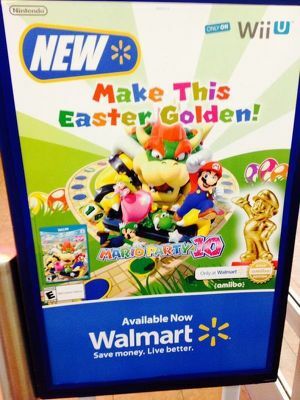 With Walmart helping to promote Mario Party 10, their eye-catching poster, emblazoned with “Make this Easter golden!”, reveals that the retailer will exclusively sell a Gold Mario amiibo. Nintendo is yet to announce the special edition figure, a golden variation of the Mario amiibo that will be made available as part of the Super Mario Collection. Nintendo of America’s support website had outed the Gold amiibo Edition, as well as a Silver amiibo Edition, although the company quickly moved to remove the listings after they were discovered. amiibo have been a success for Nintendo, announcing that 5.7 million had been sold by the end of December. However stock shortages have been problematic, with consumers airing their frustration that they have been unable to source many of the 29 amiibo that have so far launched at retail.